What Is a Common Pitch for a Hip Roof? 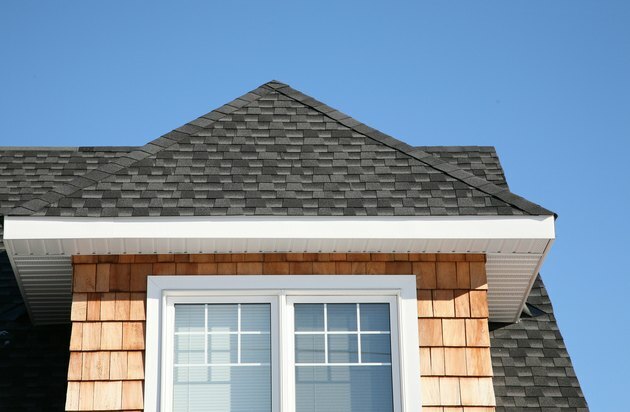 The roof of your home is built to specific measuring standards according to the type of roof that is used. One of these measuring standards applies to the degree of slope that exists between the eaves (outside edges of the roof) and the ridge (top-most center of the roof). The degree of slope is expressed as the "pitch" of the roof, and a hip roof generally has a common pitch. Even a dormer can represent a common hip roof pitch. Basic hip roof design used in residential construction generally includes four roof planes, or surfaces. These roof planes consist of two planes covering the ends of the home, starting at the ridge and ending at the eaves, and two planes covering the sides from the ridge to the eaves. This roof design is used for homes with a square or rectangular footprint at the foundation. Another basic type of hip roof design is used for foundation footprints that account for additional rooms or wings of the home that do not create a simple square or rectangular shape. The calculations for the pitch of a hip roof in residential construction focus on the angle at which the roof planes rise vertically from the horizontal line created by the wall plates found at the top of each exterior wall. The template for this pitch calculation ratio is based on a 12-inch model, with 12 inches describing the horizontal denominator of the pitch calculation ratio. The angle at which the roof plane rises will account for a consistent height in inches above the 12-inch horizontal line, and is described as the nominator of the pitch calculation ratio. One expression of a hip roof pitch, based on this formula, would be 4:12, meaning a 4-inch vertical rise for every 12 horizontal inches. Modern residential hip roof construction uses common pitch ratios, in general. The most common hip roof pitch ratios fall between 4:12 and 6:12, although variations occur based on factors such as snow, rain, and wind conditions, which is because steeper hip roof pitch ratios allow for less accumulations of snow and rain on the roof, and lower ratios provide less wind resistance. Architectural preferences also account for variations in hip roof pitch, where design specifications are created to satisfy the overall look of a home along the roof line. Examples of these variations include roof planes with gables built into them, such as a Dutch hip roof, or roof designs that incorporate ornamental features into the plans, such as dormers and fireplace chimneys. One of the most attractive features of a hip roof in residential construction is ease of design, especially in more basic plans with only four roof planes. Although a hip roof is somewhat more complicated to construct than a gable roof (a roof having only two roof planes), the calculations for measuring rafter cuts and plumb lines tend to be uniform throughout. A four-planed hip roof in particular creates an equal pitch for all roof surfaces, giving the home a clean, unified look with consistent eave lines and a minimum of variation in the roof itself. Greg Jackson is a transcriber, proofreader and editor. Jackson has been writing professionally since 1975, drawing on creative writing courses and personal experiences. His most outstanding work has been as an editor, proofreader and transcriber on two published books, "Douglas Fairbanks: In His Own Words" and "Bohemian Grove: Cult of Conspiracy."